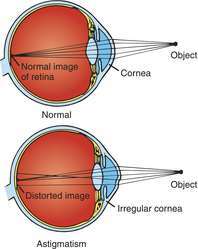 Astigmatism is the result of an inability of the cornea to properly focus an image onto the retina. The result is a blurred image. Astigmatism can be treated by the use of cylindrical lenses. The lenses are shaped to counteract the shape of the sections of the cornea that are causing the difficulty. (regular astigmatism). Irregular astigmatism may have more than two meridians of focus and they may not be 908 apart. A point of light, therefore, going through an astigmatic cornea will have two points of focus, instead of one nice sharp image on the retina. This will cause the person to have blurry vision. What the blur looks like will depend upon the amount and the direction of the astigmatism. A person with nearsightedness (myopia) or farsightedness (hyperopia) may see a dot as a blurred circle. A person with astigmatism may see the same dot as a blurred oval or frankfurter-shaped blur. Some cases of astigmatism are caused by problems in the lens of the eye. Minor variations in the curvature of the lens can produce minor degrees of astigmatism (lenticular astigmatism). In these patients, the cornea is usually normal in shape. Infants, as a group, have the least amount of astigmatism. Astigmatism may increase during childhood, as the eye is developing. The main symptom of astigmatism is blurring. People can also experience headaches and eyestrain. Parents can notice that a child may have astigmatism when the child can see some part of a pattern or picture more clearly than others. For example, lines going across may seem clearer than lines going up and down. Regular astigmatism can be caused by the weight of the upper eyelid resting on the eyeball creating distortion, surgical incisions in the cornea, trauma or scarring to the cornea, the presence of tumors in the eyelid, or a developmental factor. Irregular astigmatism can be caused by scarring or keratoconus. Keratoconus is a condition in which the cornea thins and becomes cone shaped. It usually occurs around puberty and is more common in women. Although the causes of keratoconus are unknown, it may be hereditary or a result of chronic eye rubbing, as in people with allergies. The center of the cone may not be in line with the center of the cornea. Diabetes can play a role in the development of astigmatism. High blood sugar levels can cause shape changes in the lens of the eye. This process usually occurs slowly and, often, is only noticed when the diabetic has started treatment to control their blood sugar. The return to a more normal blood sugar allows the lens to return to normal and this change is sometimes noticed by the patient as farsightedness. Because of this, diabetics should wait until their blood sugar is under control for at least one month to allow vision to stabilize before being measured for eyeglasses. Patients seek treatment because of blurred vision. A variety of tests can be used to detect astigmatism during the eye exam. 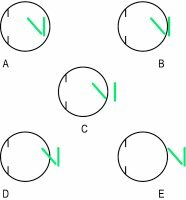 The patient may be asked to describe the astigmatic dial, a series of lines that radiate outward from a center. People with astigmatism will see some of the lines more clearly than others. One diagnostic instrument used is the keratometer. This measures the curvature of the central cornea. It measures the amount and direction of the curvature. A corneal topographer can measure a larger area of the cornea. It can measure the central area and mid-periphery of the cornea. A keratoscope projects a series of concentric light rings onto the cornea. Misshapen areas of the cornea are revealed by noting areas of the light pattern that do not appear concentric on the cornea. Because these instruments are measuring the cornea, it is also important to have a refraction in case the lens is also contributing to the astigmatism. The refraction measures the optics or visual status of the eye and the result is the eyeglass prescription. The refraction is when the patient is looking at an eye chart and the doctor is putting different lenses in front of the patient's eyes and asks which one looks better. Astigmatism can be treated by the use of cylindrical lenses. They can be in eyeglasses or contact lenses. The unit of measure describing the power of the lens system or lens is called the diopter (D). The lenses are shaped to counteract the shape of the sections of cornea that are causing the difficulty. Because the correction is in one direction, it is written in terms of the axis the correction is in. On a prescription, for example, it may say −1.00 × 180°. Cylinders correct astigmatism, minus spheres correct myopia, and plus spheres correct hyperopia. There is some debate as to whether people with very small amounts of astigmatism should be treated. Generally, if visual acuity is good and the patient experiences no overt symptoms, treatment is not necessary. When treating larger amounts of astigmatism, or astigmatism for the first time, the doctor may not totally correct the astigmatism. The cylindrical correction in the eyeglasses may make the floor appear to tilt, thus making it difficult for the patient at first. Generally, the doctor will place lenses in a trial frame to allow the patient to try the prescription at the exam. It may take a week or so to get used to the glasses, however, if the patient is having a problem they should contact their doctor, who might want to recheck the prescription. Meridian — A section of a sphere. For example, longitude or latitude on the globe. Or, on a clock, a section going through 12:00-6:00 or 3:00-9:00, etc. Refraction — The turning or bending of light waves as the light passes from one medium or layer to another. In the eye it means the ability of the eye to bend light so that an image is focused onto the retina. Contact lenses that are used to correct astigmatism are called toric lenses. When a person blinks, the contact lens rotates. In toric lenses, it is important for the lens to return to the same position each time. Lenses have thin zones, or cut-off areas (truncated), or have other ways to rotate and return to the correct position. Soft toric lenses are available in a variety of prescriptions, materials, and even in tints. Patients should ask their doctors about the possibility of toric lenses. In 1997, the Food and Drug Administration (FDA) approved laser treatment of astigmatism. Patients considering this should make sure the surgeon has a lot of experience in the procedure and discuss the possible side effects or risks with the doctor. In the case of keratoconus, a corneal transplant is performed if the astigmatism can not be corrected with hard contact lenses. Astigmatism is a condition that may be present at birth. It may also be acquired if something is distorting the cornea. Vision can generally be corrected with eyeglasses or contact lenses. The major risks of surgery (aside from the surgical risks) are over and under correction of the astigmatism. There is no cure for over correction. Under correction can be solved by repeating the operation. Berkow, Robert, editor. Merck Manual of Medical Information. Whitehouse Station, NJ: Merck Research Laboratories, 2004.
an error of refraction in which a ray of light is not sharply focused on the retina, but is spread over a more or less diffuse area; it is due to differences in curvature in the refractive surfaces (cornea and lens) of the eye. adj., adj astigmat´ic. Its exact cause is not known; some common types of astigmatism seem to run in families and may be inherited. Probably everyone has some astigmatism, since it is rare to find perfectly shaped curves in the cornea and lens, but the defect is rarely serious. If the refractive error is troublesome, corrective lenses may be needed. compound astigmatism that in which both principal meridians are either hyperopic (compound hyperopic astigmatism, with rays coming into focus behind the retina) or myopic (compound myopic astigmatism, with rays coming into focus in front of the retina). corneal astigmatism that due to the presence of abnormal curvatures on the anterior or posterior surface of the cornea. hyperopic astigmatism that in which the light rays are brought to a focus behind the retina. irregular astigmatism that in which the curvature varies in different parts of the same meridian or in which refraction in successive meridians differs irregularly. lenticular astigmatism astigmatism due to defect of the crystalline lens. mixed astigmatism that in which one principal meridian is hyperopic and the other myopic. myopic astigmatism that in which the light rays are brought to a focus in front of the retina. regular astigmatism that in which the refraction changes gradually in power from one principal meridian of the eye to the other, the two meridians always being at right angles; this condition is further classified as being against the rule when the meridian of greatest refractive power tends toward the horizontal, with the rule when it tends toward the vertical, and oblique when it lies 45 degrees from the horizontal and vertical. 1. A lens or optic system having different refractivity in different meridians. 2. A condition of unequal curvatures along the different meridians in one or more of the refractive surfaces (cornea, anterior or posterior surface of the lens) of the eye, in consequence of which the rays from a luminous point are not focused at a single point on the retina. Astigmatism: the appearance of lines as seen by (A) the normal eye and (B) the astigmatic eye. compound astigmatism that complicated with hypermetropia or myopia in all meridians. corneal astigmatism that due to irregularity in the curvature or refracting power of the cornea. mixed astigmatism that in which one principal meridian is myopic and the other hyperopic. regular astigmatism that in which the refractive power of the eye shows a uniform increase or decrease from one meridian to another. A visual defect in which the unequal curvature of one or more refractive surfaces of the eye, usually the cornea, prevents light rays from focusing clearly at one point on the retina, resulting in blurred vision. as′tig·mat′ic (ăs′tĭg-măt′ĭk) adj. & n.
an abnormal condition of the eye in which the light rays cannot be focused clearly in a point on the retina because the spheric curve of the cornea or lens is not equal in all meridians. Vision is typically blurred; if uncorrected, it often results in visual discomfort or asthenopia. The person cannot accommodate to correct the problem. The condition usually may be corrected with contact lenses or with eyeglasses ground to neutralize the condition. An optical error in which objects in the same plane, but of different orientation, are brought to a focus in different planes at the back of the eye. Thus, vertical objects may be seen in focus while horizontal objects may be out of focus. Astigmatism is usually due to a lack of sphericality in the outer surface of the CORNEA, one meridian being more steeply curved than the others. An astigmatic lens cannot produce a point image of a point object. The defect can be corrected by cylindrical spectacle lenses. From the Greek a , not and stigma , a spot or point. A condition of refraction in which the image of a point object is not a single point but two focal lines at different distances from the optical system. The two focal lines are generally perpendicular to each other. In the eye, it is a refractive error which is generally caused by one or several toroidal shapes of the refracting surfaces, or by the obliquity of the light entering the eye, but it can also develop as a result of subluxation of the lens, diabetes, cataract, keratoconus or trauma (acquired astigmatism) (Fig. A20). See meridional amblyopia; chalazion; astigmatic fan chart; circle of least confusion; ocular headache; cross-cylinder lens; focal line; fogging method; Javal's rule; stigmatism; interval of Sturm; cross-cylinder test for astigmatism; fan and block test. accommodative astigmatism Astigmatism induced by accommodation. It is not known whether this is caused by a tilt of the crystalline lens or unequal alterations of the curvatures of the crystalline lens. against the rule astigmatism Ocular astigmatism in which the refractive power of the horizontal (or near horizontal) meridian is the greatest (Fig. A21). The percentage of people with against the rule astigmatism increases beyond the age of about 45 and becomes more common than with the rule astigmatism in people beyond the age of about 55. Corneal astigmatism is the main cause of this shift. Syn. indirect or inverse astigmatism. See with the rule astigmatism. compound astigmatism Astigmatism in which the two principal meridians of an eye are either both hyperopic (compound hyperopic astigmatism) or both myopic (compound myopic astigmatism) (Fig. A22). direct astigmatism See with the rule astigmatism. indirect astigmatism See against the rule astigmatism. induced astigmatism 1. Astigmatism introduced when using contact lenses with toroidal back optic zones. This astigmatism is due to the fact that a toroidal back optic surface separates two media of different refractive indices (the contact lens and tears) and this occurs principally with rigid toric surfaces. Using contact lenses of lower refractive index reduces the amount of induced astigmatism (such as gas permeable rather than PMMA). 2. Astigmatism introduced when a contact lens slips or tilts on the eye. This is due to the fact that the chief ray is deviated and is no longer normal to the front surface of the lens. The amount thus produced is small (about 0.50 D for a slip of 3 mm) but increases if the lens tilts as well as slips. See residual astigmatism. internal astigmatism See total astigmatism. inverse astigmatism See against the rule astigmatism. irregular astigmatism Ocular astigmatism in which the two principal meridians are not at right angles to each other. This condition is often the result of injury or disease (e.g. keratoconus), but can also exist in an eye with irregularities in the refractive power in different meridians of the crystalline lens. See combination lens; piggyback lens. lenticular astigmatism Astigmatism of the crystalline lens. It is usually due to variations in the curvature of one or both surfaces and much less commonly to irregularities in its refractive index. Lenticular astigmatism is typically against the rule. mixed astigmatism Ocular astigmatism in which one principal meridian is hyperopic and the other myopic (Fig. A22). oblique astigmatism 1. Astigmatism in which the two principal meridians are neither approximately horizontal nor approximately vertical. 2. Aberration of an optical system that occurs when the incident light rays form an angle with the optical axis which exceeds the conditions of gaussian optics. It gives rise to separate tangential and sagittal line foci instead of a single image point. See allometropia; anastigmatic lens; Petzval surface; paraxial ray; interval of Sturm. physiological astigmatism Astigmatism not exceeding 0.5-0.75 D in the normal eye. refractive astigmatism See total astigmatism. residual astigmatism Astigmatism still present after correction of a refractive error. See induced astigmatism. simple astigmatism Ocular astigmatism in which one principal meridian of the eye is emmetropic and the other myopic (simple myopic astigmatism) or hyperopic (simple hyperopic astigmatism) (Fig. A22). total astigmatism Astigmatism of the eye comprising both anterior corneal and internal astigmatism (i.e. lenticular astigmatism) and astigmatism of the posterior surface of the cornea. Syn. refractive astigmatism. See total rule. with the rule astigmatism Astigmatism in which the refractive power of the vertical (or near vertical) meridian is the greatest (Fig. A21). Syn. direct astigmatism. See against the rule astigmatism. A condition of unequal curvatures along the different meridians in one or more of the refractive ocular surfaces. n a defective curvature of the refractive surfaces of the eye, resulting in a condition in which a ray of light is not focused sharply on the retina but is spread over a more or less diffuse area. an error of refraction in which a ray of light is not sharply focused on the retina, but is spread over a more or less diffuse area; it is due to differences in curvature in various meridians of the refractive surfaces (cornea and lens) of the eye. The results may have important implications for surgical procedures to correct visionfor example, to minimize residual astigmatism in patients with cataracts undergoing intraocular lens replacement surgery. 2mm incision in the steepest meridian on the magnitude of pre-existing astigmatism which was evaluated by keratometric reading. Based on the focal point with reference to the retina, astigmatism is divided into simple astigmatism (simple myopic or simple hypermetropic), compound astigmatism (compound myopic or compound hypermetropic) and mixed astigmatism. Clear corneal incision (CCI) can induce astigmatism of 0. Astigmatism can be defined in several ways and it is worth exploring each of these in turn as the correct diagnosis depending on subtype has implications on selecting the appropriate treatment option. Astigmatism is a common condition causing blurred vision due to the irregular shape of the cornea or the lens inside the eye, which are responsible for focusing light entering the eyes. A clear and simple layman's explanation of astigmatism is vitally important in practice to avoid confusion and unnecessary worry on the part of the patient. Residual astigmatism after cataract surgery presents an additional challenge for patients as it distorts vision and may increase the requirement for glasses, said David F.
In this study, we analyzed post-operative corneal astigmatism after phacoemulsification with foldable intraocular lens implantation through a clear corneal incision (CCI) and evaluated the effect of small superior, superotemporal, and superonasal CCIs on post-operative corneal astigmatism. Astigmatism is an optical condition of the eye in which light rays from an object do not focus to a single point but form a set of two focal lines because of variations in the curvature of the cornea. Conclusion: Intralesional 5-Fluorouracil injection improved cosmesis of primary as well as recurrent pterygia, but did not have statistically significant effect on corneal astigmatism. Vision may be reduced due to astigmatism induced by the pterygium.